Infonews editor Fraser Mills described the earthquake, as felt from Wanaka, as a "long rolling quake" which "shook doors, rattled cupboards" and the house he was in. New Zealand Earthquake Report - Jul 15 2009 at 9:22 pm (NZST). Magnitude 6.6, Wednesday, July 15 2009 at 9:22 pm (NZST), 90 km north-west of Tuatapere. Magnitude 7.8, Wednesday, July 15 2009 at 9:22 pm (NZST), 100 km north-west of Tuatapere. Magnitude 6.1, Wednesday, July 15 2009 at 9:41 pm (NZST), 150 km west of Tuatapere. Magnitude 5.9, Thursday, July 16 2009 at 1:50 am (NZST), 120 km north-west of Tuatapere. A small tsunami of 0.17m was recorded at Jackson Bay. Based on that information the potential threat warning is now lifted. 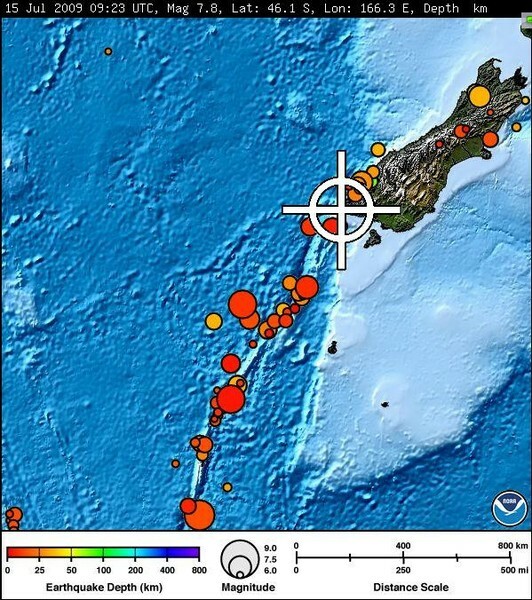 No further tsunami threat exists for New Zealand coastlines as a result of the 7.8 earthquake that occurred near Tuatapere today at 2123 NZST. to go to higher ground or at least one kilometre inland. Below is a map and the initial reports availble online. Felt in souther South Island. This is an update for the earlier posted earthquake. Note the change in magnitude. This earthquake was widely felt in the South Island and as far north as Taranaki. Magnitude 7.8 - OFF WEST COAST OF THE SOUTH ISLAND, N.Z.